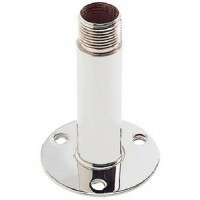 Antenna base mount kit 10cd/bx Box: 10 (Cd.).. 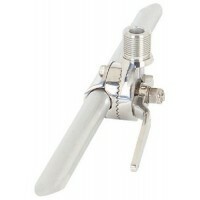 Investment cast 316 stainless steel construction with dual swiveling mounts allows for full adjustab.. Die Cast Zinc Chrome PlatedDie cast zinc construction with a mirror finish chrome plating will accep..
Molded nylon. 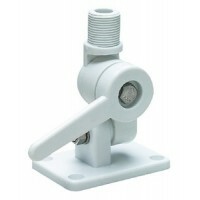 Bracket will accept any standard antenna with 1"-#14 threads. Fastener 1/4FH. 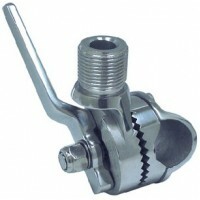 Clam She..
Investment cast 316 stainless steel construction. Designed to allow antenna wire to feed directly th..
Injection molded from UV stabilized nylon with dual swiveling mounts for full adjustability. Design ..
Investment cast 316 Stainless. Size: 4-5/8"..
Molded nylon. 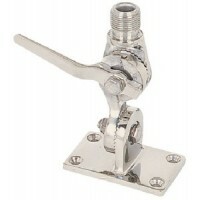 A: 3-3/16"Fits: 7/8" - 1" TubingB: 3-5/8"..
All stainless steel construction. Ideal for TV, Loran, GPS and VHF antennas. Size: 4"Fits: Antennas .. Highly polished, fits both 7/8" and 1" rails and standard 1"-14 threaded antenna ferrules. Material:.. 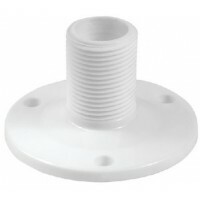 Fits rail tubing 7/8" or 1" and standard 1"-14 threaded antenna ferrules. High impact nylon. Color: .. 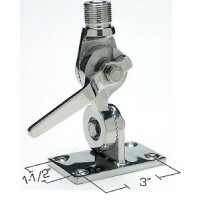 Four-way ratchet design available in either chrome plated cast polished brass or stainless steel. Fo..
Hi-Impact super tough nylon. Weather resistant. Accepts all antennas with 1" - 14 threads. Comes wit.. Flexible fishing rod and tool holder. Larger size will accommodate boat hooks and boarding ladders. 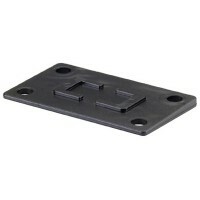 ..
A heavy duty, 4-way versatile auxiliary mount. Fits almost any mounting location and still permits l.. 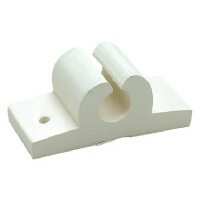 Solid nylon with handle for deck or bulkhead mounting. 1"-14 male thread. Not for antennas longer th.. Stainless steel. Quick release lay down hand and 9/32" feed-thru hole for cable. Mounts on 7/8" and .. 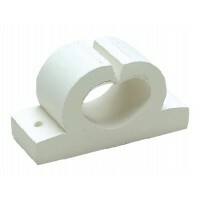 Designed for quick and easy installation on 7/8" and 1" vertical or horizontal rails. Handles up to ..
4" high. 1"-14 thread. Stainless steel. Perfect for radar arches. May be used with #4364 1' extensio..
Is white polycarbonate and enables antenna to lift and lay with positive snap. 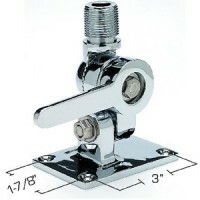 Leveling plate provid..
Chrome-brass base for deck or side mounting. Base is dual joint, free pivoting to allow easy lowerin..
Standard 1" - 14 thread. 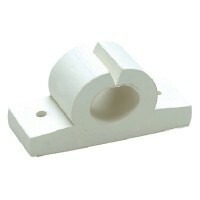 Attaches to 7/8" and 1" horizontal rails. White nylon construction. Slot on..
For deck or side mounting. Quick action handle makes operation easy. 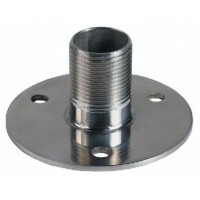 Bolt holes: 5/16" dia., 3" x 1-..
Attaches to 7/8" and 1" vertical, horizontal and angled rails. 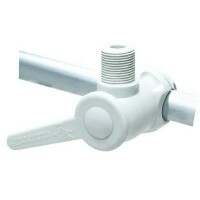 Lever action makes lowering antenna e..
Swivel type ratchet action, fast release design for quick and easy laydown. 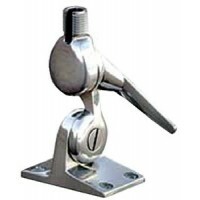 Mounts easily on 7/8" to..
Ratchet mount ss four way Material: Stainless Steel.. 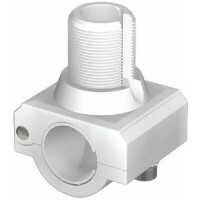 Heavy-duty, low profile, 1" high mount with standard 1"-14 threads. Great for GPS, Marine TV and sho..